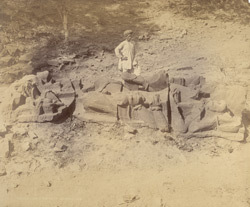 Photograph of a broken statue of Mahakali of 1396, lying in a field at Panthia, taken by Henry Cousens in 1893-94. The goddess Mahakali, or Kali, is Shiva's spouse. She has a dominating nature and is often represented standing on top of Shiva who lies under her feet to control his power. In the early Indian texts of the Puranas she is described as the goddess of war, sacrifice, destruction and blood-shed. In iconographic representations she has ten arms carrying a sword, bow and arrow, suckle, mace, wheel, shield, bowl, a human skull, a trident and conch. She wears a necklace of skulls and a belt made of dismembered human heads and hands. She has fangs, feeds herself on fresh human blood and lives in cremation grounds. Her awful appearance imparts terror and destruction.